Albany, Ore. – February 16, 2015 – Mountain House, the best-selling brand of camping, backpacking, and emergency preparedness meals, released results today of a recent study designed to inform consumers how popular brands of emergency meals manage oxygen levels, a critical element in long term emergency food. This information is increasingly important as consumers continue to move from tried-and-true #10 cans to flexible pouches. 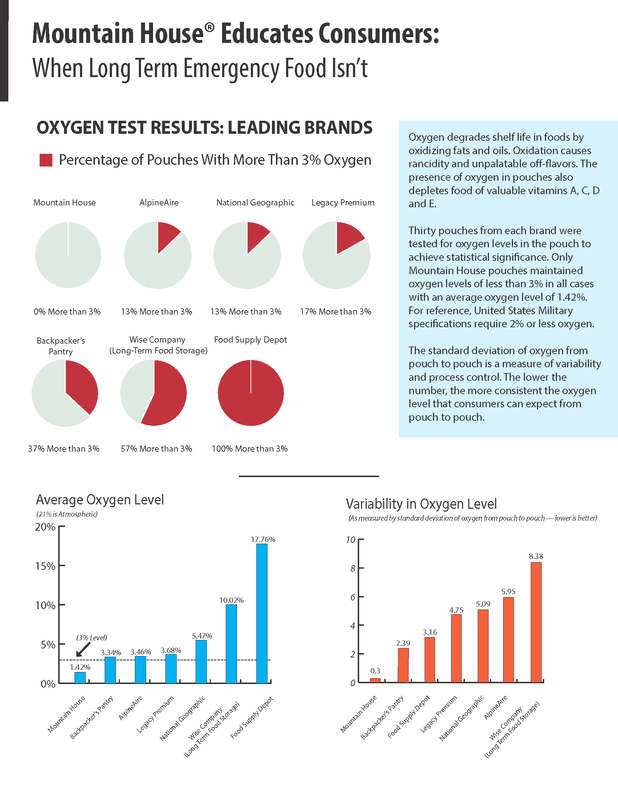 The study, conducted by Fres-co System USA, Inc., tested the oxygen levels found in Mountain House pouches as well as those of six other brands. The study measured the oxygen levels inside 30 pouches from each brand. Only Mountain House pouches maintained an oxygen level of less than 3 percent in all cases, with an average oxygen level of 1.42 percent. This bests the U.S. military specification of less than 2 percent oxygen. All other brands had average oxygen levels above 3 percent. Food Supply Depot fared the least favorable with near atmospheric average levels of oxygen at 17.76 percent. Based in Albany, Ore., Mountain House has been the first choice of backpackers, hikers, campers and emergency preparation experts for nearly 50 years. Why? Great taste, ease of use and reliability, no matter how extreme the environment. As a result, Mountain House commands more than 70 percent of the outdoor freeze dried meal market according to the Outdoor Industry Association. Their line of meals in pouches have a proven shelf life of 12+ years. Foods in their #10 cans have a proven shelf life of 25+ years. For more information and a complete list of products, visit www.mountainhouse.com. This entry was posted in Freeze Drying, Hiking, Mountain House, Press Release, Survival and tagged longest, mountain house, oxygen, proven, shelf life, study by Mountain House. Bookmark the permalink.